The Martin Luther King holiday is a time when thousands of people take the opportunity to serve someone else. This year, staff from Chick-fil-A, along with participants from the Westside Future Fund, Mercedes-Benz, Atlanta City Council and other volunteer groups, came together to do the same. 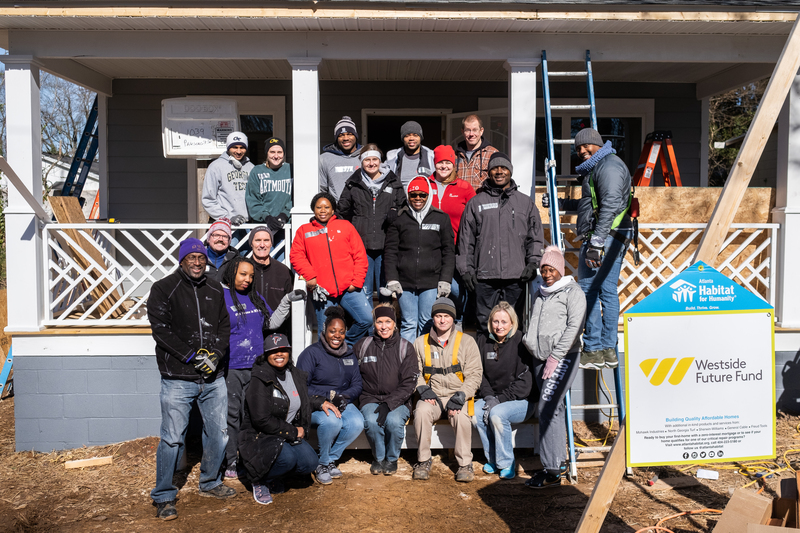 On MLK day, these 30 volunteers participated in a Habitat for Humanity build on Atlanta’s Westside, building a home for Santecia Bynum and her 9-year-old daughter. Bynum, a previous resident of Atlanta’s Westside, will be returning to the neighborhood as a proud, first-time homeowner. She currently works in the custodial department at Emory University and looks forward to working on DIY projects for her new home. Although the energy at the build was fun and festive, it was a long day of hard work. The January 21 build was day six of Atlanta Habitat’s Eight Day Build program. 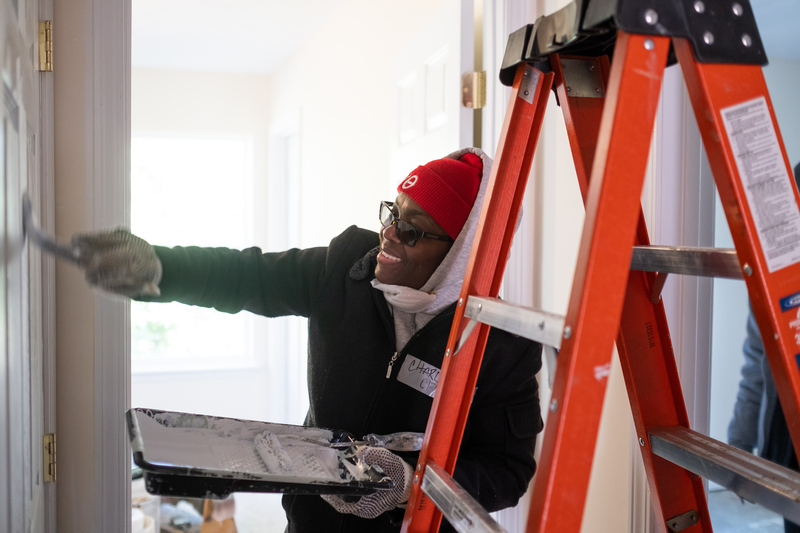 New homebuyers, along with dozens of volunteers, are guided by house leaders and skilled supervisors to build high quality, affordable and energy-efficient homes. Through their first-time homebuyer program, qualified applicants have the opportunity to build and buy a home with a 30-year, zero-interest mortgage in select neighborhoods of Atlanta. The home is being built on the historic Westside – a very important area of revitalization for Atlanta Habitat and Chick-fil-A. Both organizations, in partnership with the Westside Future Fund, are working to bring stability back to this historic area through home ownership. While many people take the day off for Martin Luther King Day, Chick-fil-A encouraged its staff to have a “day on.” Chick-fil-A Support Center staff not only support the company’s restaurant Operators, they support the community in which they work, live and play. The Habitat for Humanity build is just one example of ways employees chose a day of service instead of a day at home. “I feel it is important to serve others and it reminds me that we are to look not only to our own interests, but also to the interests of others.” Tim Mangan, Development & Construction at Chick-fil-A, Inc.
“I made a commitment in 2018 to volunteer more in areas that are important to me and the diverse opportunities in the Chick-fil-A volunteer portal make it simple and easy.I had worked on this particular house the month before and was happy to continue and see the progress. I especially enjoyed working alongside the new homeowner.” Stephanie Armistead, Sustainability at Chick-fil-A, Inc.
“At Chick-fil-A, one of our core values is “here to serve,” and that doesn’t only apply to serving the guests who visit our restaurants. It means serving our communities, too. MLK Day is an opportunity for us to reflect on Dr. King’s life and how we can continue to honor his legacy by seeking ways – big and small – to take care of each other,” said Rodney Bullard, vice president of corporate social responsibility for Chick-fil-A Inc. and executive director of the Chick-fil-A Foundation. Dr. Martin Luther King once said, “Our goal is to create a beloved community, and this will require a qualitative change in our souls as well as a quantitative change in our lives.” These organizations came together not only to honor the civil rights hero, but to accomplish his goal by working together to create a community where all people have access to quality affordable housing in safe, vibrant neighborhoods with opportunities to thrive. And Bynum, is already thinking about how she can serve others.